Click here to view the latest Sim2 Products on offer. People often ask us who makes the best projectors, and there are many out there that, on paper, appear to give the best performance. Not one manufacturer that we’ve seen, gives an accurate idea of how good their optics are. The optical path of the light in a projector is the most critical factor in the resultant picture quality, as it is with a good camera. It’s absolutely no good having a full 1080p panel (be it DLP / LCD or D-ILA) if the lens can’t focus all the pixals onto the correct place on the screen. Take a close look at any projected picture and you’ll see that for example a pure white line (such as text) will have coloured edges spanning in some cases several pixals. If the optics can’t focus the light accurately, you end up with a fuzzy lack of detail. Sim2 projectors comprise approximately two thirds of their weight and cost in the optics. This is why they have stunning, detailed and vibrant three dimensional pictures. Always use your own eyes when choosing a projector, never trust anyone else’s opinion (including ours!) and ignore the specifications! The C3X Lumis 3D projection system. 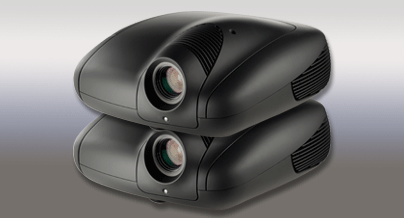 We think that Sim2 Projectors are one of the foremost world-class projector manufacturers. They’d have to be for someone like Francis Ford Coppola to endorse them!